The first word in Pastrix is a four-letter one. If you find that offensive, go ahead and put the book down now. If, however, you find it challenging or intriguing, keep reading. 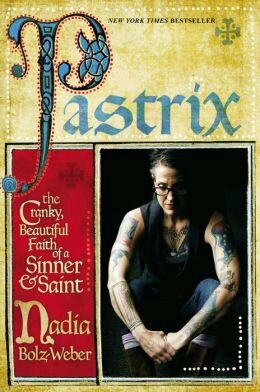 In Pastrix, Nadia tells the story of how she found her way from a very conservative Christian background (where women were not even allowed to teach Sunday school to teen boys) to being the pastor of a church (with many gay, homeless and otherwise non-traditional congregants.) She spent years as an alcoholic and, after sobering up, felt most at home as a Wiccan. But her husband (then a seminary student) introduced her to the Lutheran liturgy and she began to understand God- and grace- like she never had before. Eventually she felt the call to ministry and attended seminary- with her parents blessing. I also grew up in churches even more conservative than the ones of Nadia’s childhood. I still haven’t sorted out everything I believe about women in the pulpit, or gays in the church, or lots of other things. But I loved this book! In Pastrix, Nadia explains grace better than almost anyone I’ve ever heard. Its easy to look at others and judge them; its a lot more challenging when the Holy Spirit convicts you of being proud, judgemental and not loving your neighbor. Pastrix, in the end, isn’t really about Nadia, or how she looks, or the language she uses. Its about Jesus. And it was like a cool drink of water in a hot, dry place. This entry was posted in Non-Fiction, Top 10 and tagged alcoholic, Bible, Christian, gay/lesbian, non-fiction, pastor. Bookmark the permalink.